VICUSdt has been working on this project all along this year, collaborating in the design of the prototype of a LNG membrane tank that will be soon constructed and tested. 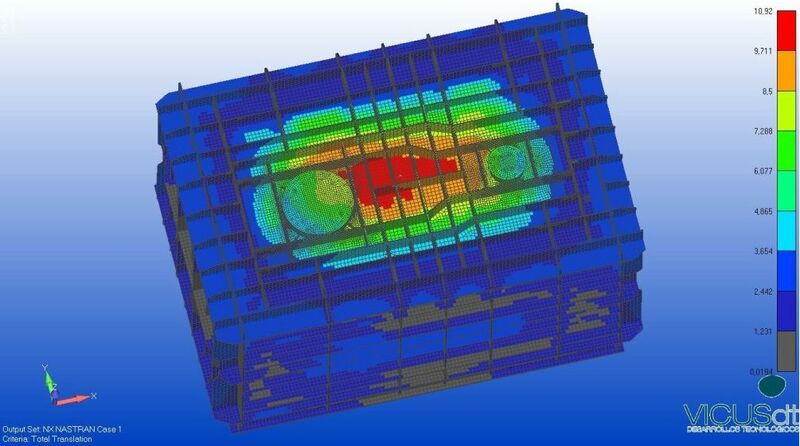 FEM structural analysis was carried out in order to determine the validity of the dimensioning and design of this prototype, under extreme temperatures, high pressures and variable loads. In parallel, acceleration linked to ship movements due to waves, and sloshing caused in these situations, are also calculated in this project. Besides VICUSdt, Gabadi – leader of the consortium-, NEO-CH4 Galicia and Inova Labs, have joined forces in this project. LNG Prototype Pack initiative is funded by the Axencia Galega de Innovación (GAIN) through the Conecta Pyme program, with funds from Feder and the Ministry of Industry.